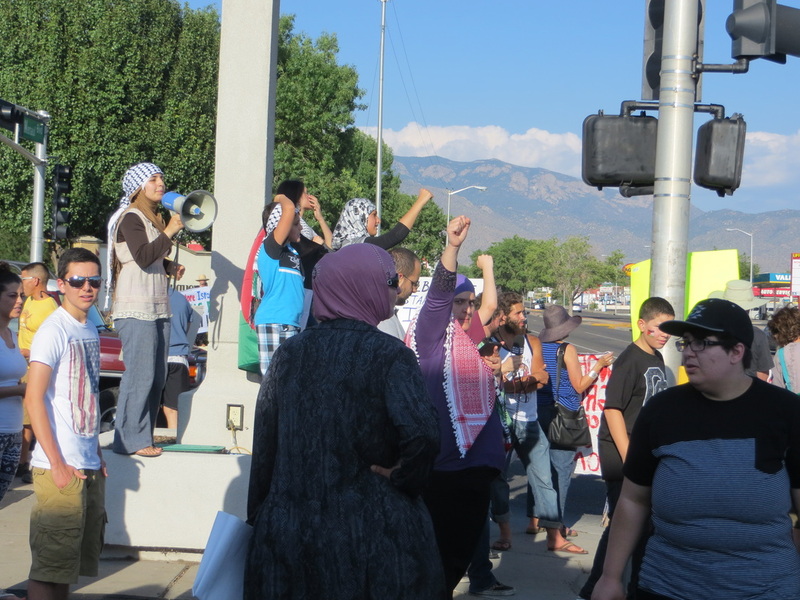 On Thursday, July 24, an anti-Israel demonstration was staged at the intersection of Menaul and Louisiana NE in Albuquerque. It was billed as being part of what was claimed to be a "National Day of Action for Gaza" to protest Israeli military action in Gaza, especially the growing numbers of civilian casualties. One of my fellow conservatives informed me about the demonstration and I attended it as one of a number of counter-demonstrators expressing support for Israel. I'm no expert at crowd estimation, but I'd guess the anti-Israeli side had something between 50 and 100 people; the pro-Israel side was smaller, perhaps a couple of dozen. 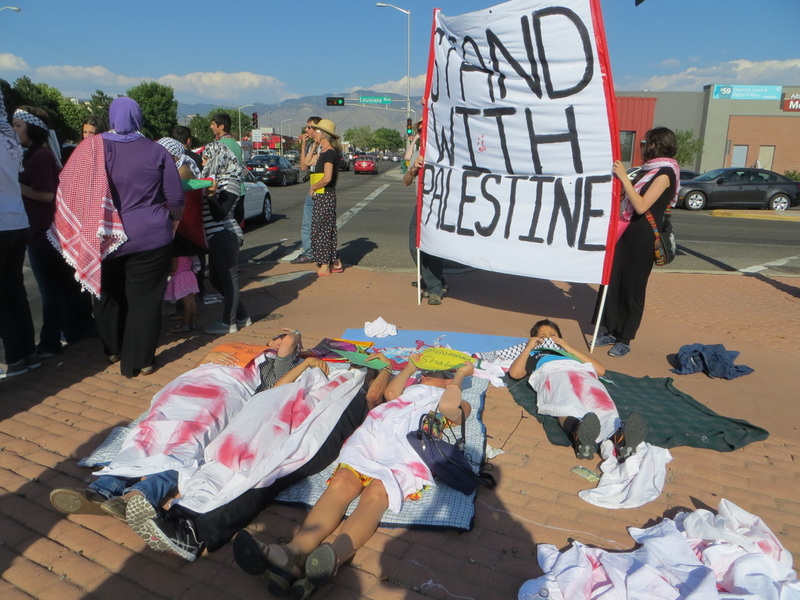 The anti-Israel group staged a "die-in" on the southwest corner of the intersection as part of their protest. Before the demonstration, there were suggestions to place placards reading something like "one less terrorist" beside the "corpses", but this was never done; at least I didn't see it. 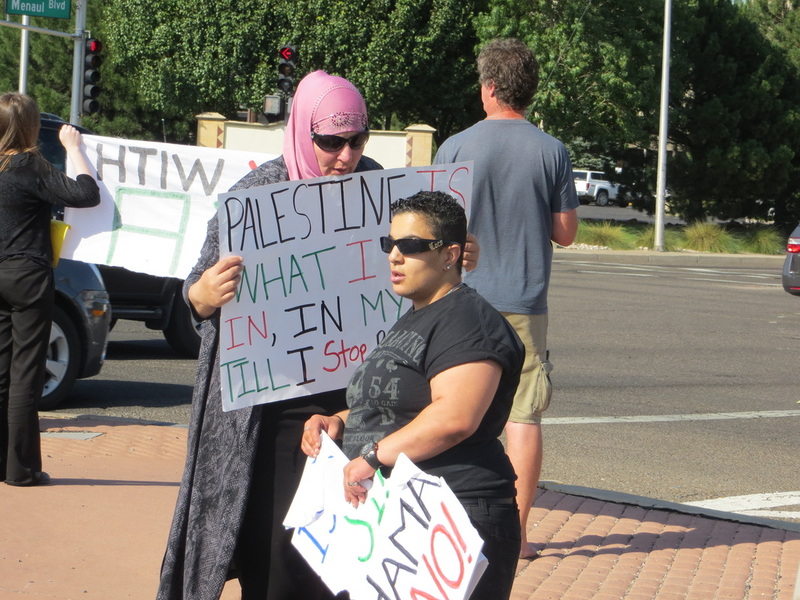 There was a reporter from the Albuquerque Journal there taking pictures of the event, including a picture that included my pro-Israel sign. We had a brief but pleasant conversation in which he seemed sympathetic to my point of view, or at least not unsympathetic. At that time, I was either alone or with one other pro-Israel demonstrator on the SW corner along with a bunch of the antis; the other pro-Israel people were on the north side of Menaul. Nothing brilliant or terribly provocative, but enough to show where I stand. She shoved me and grabbed my sign and broke it into pieces. I went back to my car because I wanted to call the Albuquerque Journal reporter to tell him what had happened; however, as luck would have it, he was there, near my car. Again we had a pleasant conversation. I checked the paper the next couple of days to see how the demonstration was covered; however, if there was any coverage, it eluded me. I talked to one of the police officers there, and she advised me that the offense would be classified as a misdemeanor, and they cannot take action (i.e., arrest someone) for a misdemeanor unless they see it themselves -- a report from me and/or other eye witnesses wouldn't suffice. Apparently other people were also accosted by this specimen, and the police did take their statements too. A young lady on the pro-Israel side took my information and the information of others who had complained of this woman's behavior, and there may yet be legal action against her. I saw no other anti-Israel demonstrator behave this way, but they made no effort to separate her from their group; she stayed with them to the end. This is in sharp contrast with Albuquerque Tea Party policy, which explicitly does not tolerate such behavior at any of their public demonstrations. The anti-Israel demonstrators were a noisy bunch, shouting "Free Palestine". "Occupation is a Crime", and accusations of Israel committing "war crimes" and "genocide"; sometimes they used a bull horn. 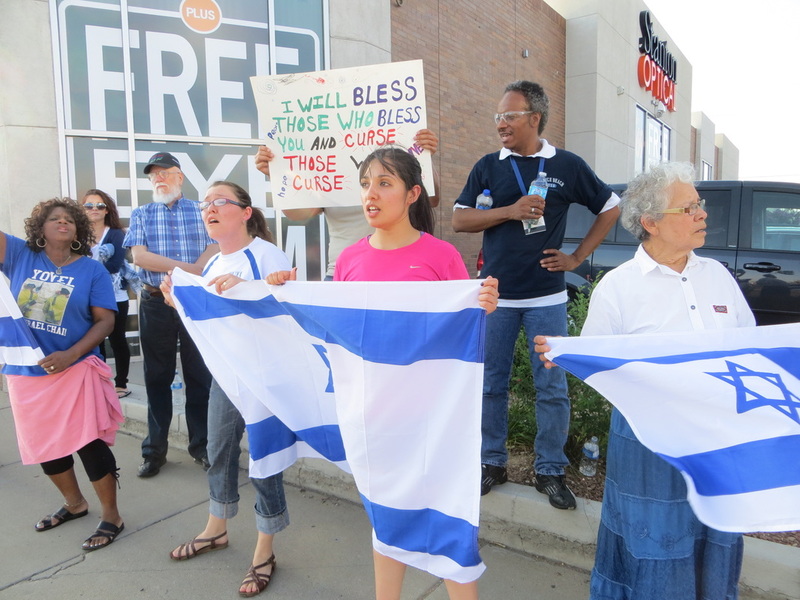 The pro-Israel group was much quieter, mostly contenting themselves with singing hymns and other songs. As demonstrations and unruly behavior go, this was all pretty small potatoes; hardly worth much comment were it not for the fact that it was just one pixel in a far bigger picture. Let's step back a bit and take a look at this bigger picture. The protest was ostensibly against the civilian casualties resulting from Israel's military action against Hamas in the Gaza Strip. It is quite true that there have been hundreds, perhaps over a thousand, killed and many more injured. (The actual numbers are uncertain because the alleged casualty counts come from Hamas propaganda organs.) These casualties have spurred widespread criticism of Israel even in the United States, and much harsher condemnation in many other countries. Even the Obama Administration has urged -- demanded -- that Israel show "restraint" to reduce civilian casualties and has demanded that both sides accept a cease fire, and generally has acted as if there were a moral equivalence between the two parties to the conflict. But why is this conflict happening? Why are there so many civilian casualties, even though Israel tries to minimize them? Quite simply, this is happening because Hamas has been raining thousands of rockets down on Israel. It has also expended enormous effort and resources, some of it supplied by foreign aid, to construct a vast labyrinth of tunnels at the Gaza borders, to both smuggle rockets and other weapons into Gaza from Egypt and to infiltrate Israel and commit acts of terror and even kidnappings. (These are resources and efforts that could and should have been used to better the lives of the impoverished citizens of Gaza.) Israel has responded with a military campaign to destroy the rockets, rocket launchers, and tunnels. Does anyone imagine America would do less if Mexico, say, were to rain thousands of rockets down upon our country? Civilian casualties are inevitable in any substantial military conflict, but they have been greatly amplified in this conflict by the fact that Hamas hides its rockets and other weapons in civilian areas, including mosques and schools, even United Nation schools. They quite literally use their civilian population as human shields to protect their military resources, in gross violation of the Geneva Conventions and other so-called rules of war. It is as if they wanted to maximize their civilian casualties. "As if?" The harsh reality is that they do want to maximize their civilian casualties. Some people may find that accusation difficult to believe, but ask yourself: what could possibly be the goal of Hamas when they started this war? Hamas's ultimate goal is the total destruction of Israel (more on that below), but not even the most self-deluded Islamist fanatic can possibly believe they can accomplish this militarily. They know Israel is enormously stronger militarily. Even if that were not the case, the rockets Hamas is firing at Israel would be virtually useless militarily because they are far too inaccurate to hit a specific military target. They are, quite simply, terror weapons, much like the V2 rockets the Nazis fired at England during World War II. These also were of little military significance because they also were too inaccurate to hit anything smaller than the city of London. The only purpose of both Hamas's rockets and the Nazi V-2's was to cause civilian death and destruction and terrorize the civilian population. True, Hamas's rocket barrage causes less suffering and destruction in Israel than did the Nazis' V-2's in London, but that is only because Hamas is less competent than the Nazis and London had no defense like Israel's "Iron Dome" missile defense. The difference does not reflect any difference in the goals or any moral superiority of Hamas over the Nazis. Furthermore, Hamas obviously knew their rocket attacks on Israel would result in retaliation, and that the retaliation would result in more devastation in Gaza than they could ever hope to inflict on Israel. After all, this is far from the first conflict of this sort since Israel withdrew from Gaza in 2005, and exactly the same thing has happened in the prior conflicts. Why, then, did they choose to do it? The only possible reason is that they hope the mounting civilian casualties will turn world opinion against Israel, and hence turn other nations' policies against Israel. The goal is to provoke precisely the sort of protest we saw in a small way on July 24 in Albuquerque, and are seeing on a much larger scale in many other nations around the world. Given that this is the goal, the more civilian casualties the better, and hence Hamas is happy to use their own people as human shields for their rockets and other weapons. Hamas's strategy required making some assumptions that, in a more rational world, would seem absurd: it assumes that people would ignore the fact that Hamas initiated the conflict by firing their rockets at Israeli civilians; that Hamas's goal is to liquidate Israel while Israel's goal is only to live in peace; and that Hamas is deliberately hiding its military assets behind civilians in order to maximize casualties for their propaganda machine. The fact that Hamas's strategy is working to a considerable degree is a sad reflection on the state of political intelligence and morality in today's world. The charter is heavily larded with turgid Islamist and jihadist ideology, and throughout is the theme that liquidation of Israel is the fundamental goal of all their policies. The wording often is in terms of "jihad" for "liberating [every inch of] Palestine" and similar terms, rather than liquidating Israel, because they deny Israel exists except as the part of Palestine occupied by the "Zionist invaders". Even seemingly benign secondary goals, such as improving the well-being of the people, turn out to be so that they will more readily join the anti-Israel jihad. Joining the jihad is asserted to be the religious duty of all Moslems everywhere; Moslem countries (especially Egypt) that have made peace with Israel are harshly criticized. From either source, it is obvious that eliminating Israel is not just one plank in a more conventional political platform. On the contrary, it is the central reason for existence of Hamas; to strip elimination of Israel from the Hamas charter would be like stripping belief in God and the worship of God from the Roman Catholic Church. It would simply no longer exist. Some apologists for Hamas occasionally argue that the Charter (written in 1988) is just a historical document, and they offer some obscure reasons for why it hasn't been repudiated. Many others, however, make it clear that they still stand by the Charter. In the 1930s, many Jews assumed that the Nazis couldn't really mean their most vicious statements, and 6,000,000 Jews died in the Holocaust as a result of that erroneous assumption. We may prefer to ignore that hideous bit of history, but Israelis cannot ignore it, and they are not prepared to risk making that mistake again. Unlike our nation, Israel is blessed with a leader in Benjamin Netanyahu who is unreservedly on the side of his own country and who has summed up the essential nature of the conflict in which they find themselves with two memorable statements. If the Palestinians laid down their arms today, there would be no more killing; if Israel laid down its arms, there would be no more Israel. Israel uses its [Iron Dome] rockets to shield its civilians; Hamas uses its civilians to shield its rockets. Anyone who cannot see that these differences prove that Israel deserves the unqualified support of civilized people everywhere is so lacking in reason and/or morality as to be beyond the reach of either rational argument or appeals to simple decency. Reproduction and/or distribution of this article by any means is strongly encouraged.